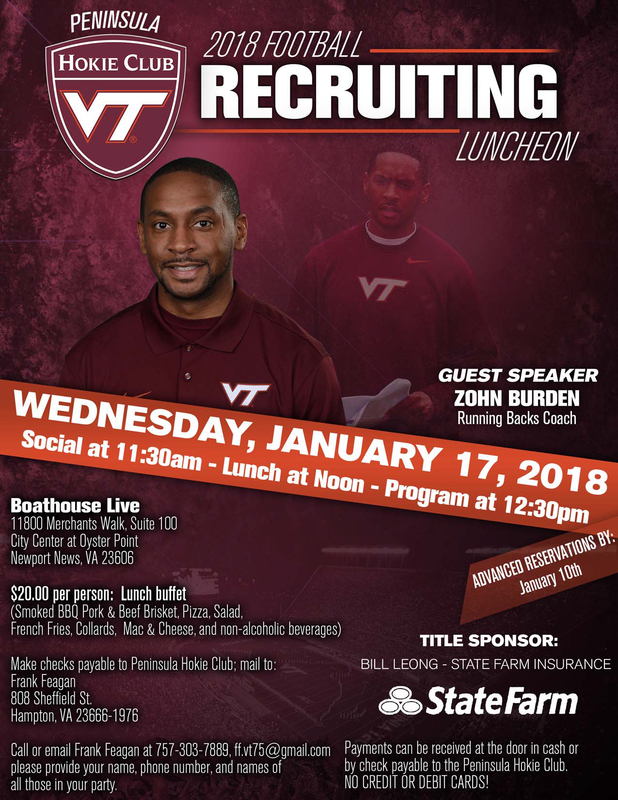 Peninsula Hokie Club | Welcome to the Peninsula Chapter of the Virginia Tech Hokie Club! Cost: $48 per person. Click to Pay for Dinner Reservation via PayPal. Buffet Menu: Carved Prime Rib w/Au jus and horseradish sauce, Atlantic Salmon w/Champagne dill sauce, seasoned green beans, candied carrots, roasted red bliss potatoes, seasoned rice, garden salad, rolls w/butter, assorted desserts, coffee, tea lemonade. Event to include: complimentary beer keg and soft drinks, cash bar, rafﬂe and silent auction. Time: 9:00 am Shotgun Start. Cost: $110 for individual golfers (includes golf, cart, driving range, gourmet lunch, after golf social with beer) No on-course game sales this year. Pay via PayPal by clicking here. Prizes: Top 2 places in each flight; longest drive and closest to the pin. Drawing for remaining prizes. Golf Registration cut-off date for non-sponsor golfers is Monday, April 9, 2018. Roy Burrows will coordinate entry deadline with Sponsors. Join fellow Hokies for game watching parties at Buffalo Wild Wings! 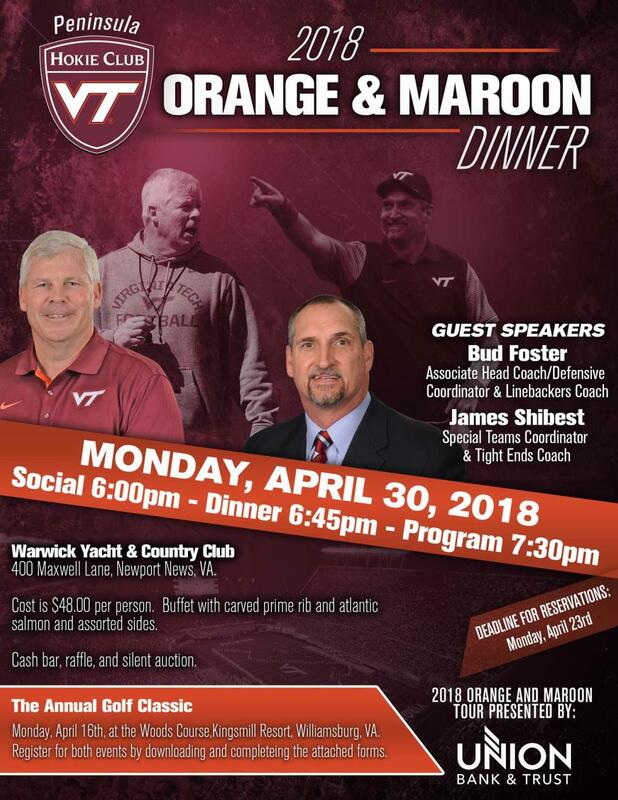 *10% of all of your food and drink bill goes to the Peninsula Hokie Club Frank Seamster Scholarship Fund. We thank Buffalo Wild Wings, Jefferson Avenue, through its HomeTeamAdvantage program, for its support of the Peninsula Hokie Club Frank Seamster Scholarship Fund. This is the second year that BWW will donate 10% of our meals’ totals to our local scholarship fund. Our individual HomeTeamAdvantage cards will be available at the parties. Every time we eat at BWW, Jefferson Avenue during the 2017 season and in 2018 please present your card, and 10% of your total bill will automatically go toward funding our PHC scholarship. In 2016 we ate and donated almost $100; for 2017-2018, let’s see if we can eat our way to $250!